The EP ultra-precision resistor series from Alpha Electronics offers highly stable wire-bondable resistors with a maximum resistance up to 30kΩ. By utilising Alpha's Bulk Metal® foil resistor technology, they are able to produce resistors with low temperature coefficients and excellent long-term stability. The Alpha EP resistors offer similar specifications to the Alpha MP and MQ resistor series in terms of power ratings, tolerances and resistance values available but are wire-bondable variants. These ultra-precision, highly stable resistors are ideal for precision hybrid applications such as A/D hybrids. The EQ ultra-precision resistor series from Alpha Electronics offers highly stable wire-bondable resistors with a maximum resistance up to 60kΩ. By utilising Alpha's Bulk Metal® foil resistor technology, they are able to produce resistors with low temperature coefficients and excellent long-term stability. The Alpha EQ resistors offer similar specifications to the Alpha MP and MQ resistor series in terms of power ratings, tolerances and resistance values available but are wire-bondable variants. The MP ultra-precision resistor series from Alpha Electronics offers a wide resistance range from 30Ω up to 30kΩ with tight tolerances down to +0.05% (100Ω to 30kΩ), all in a small surface-mount package. By utilising Alpha's Bulk Metal® foil resistor technology, they are able to produce resistors with low temperature coefficients and excellent long-term stability. The Alpha MP series J-lead terminals provide flexibility compared to standard fixed surface-mount resistors as the resistive element internally is mechanically isolated from the leads via gold wire-bonding. Alpha's MP surface-mount, ultra-precision resistor series exhibit excellent high frequency characteristics thanks to their Bulk Metal® foil resistor technology, making them suitable for the most demanding precision applications. These resistors are constructed using an outer coating of epoxy resin, which provides excellent resistance to moisture, heat and solvents. Internally, the resistive element is mechanically isolated from the lead frames using gold wire-bonding. The MPH ultra-precision resistor series from Alpha Electronics offers a wide resistance range from 30Ω up to 30kΩ with tight tolerances down to +0.05% (100Ω to 30kΩ), all in a small surface-mount package. By utilising Alpha's Bulk Metal® foil resistor technology, they are able to produce resistors with low temperature coefficients and excellent long-term stability. Expanding on the standard Alpha MP series, the MPH series offers gold-plated J-lead terminals making them suitable for higher temperatures of up to +200°C. The gold-plated J-lead terminals provide flexibility compared to standard fixed surface-mount resistors as the resistive element internally is mechanically isolated from the leads via gold wire-bonding. Alpha's MPH surface-mount, ultra-precision resistor series exhibit excellent high frequency characteristics thanks to their Bulk Metal® foil resistor technology, making them suitable for the most demanding precision applications. The MPP Z-foil resistor series from Alpha Electronics offers ultra high-precision including a TCR of ±0.2 ppm/°C (typical) as well as a wide resistance range from 30Ω up to 20kΩ, all in a small surface-mount package. By utilising Alpha's Z-foil resistor technology, they are able to produce resistors with a temperature coefficient of almost zero and excellent long-term stability. Expanding on the standard Alpha MP series, the MPP series offers double the power rating at +70°C and the same power rating up to +125°C. The J-lead terminals provide flexibility compared to standard fixed surface-mount resistors as the resistive element internally is mechanically isolated from the leads via gold wire-bonding. Tight TCR of ±0.2 ppm/°C (typical) thanks to Alpha's Z-foil technology. Alpha's MPP surface-mount, ultra high-precision resistor series exhibit excellent high frequency characteristics thanks to their new generation Z-foil technology, making them suitable for the most demanding precision applications. 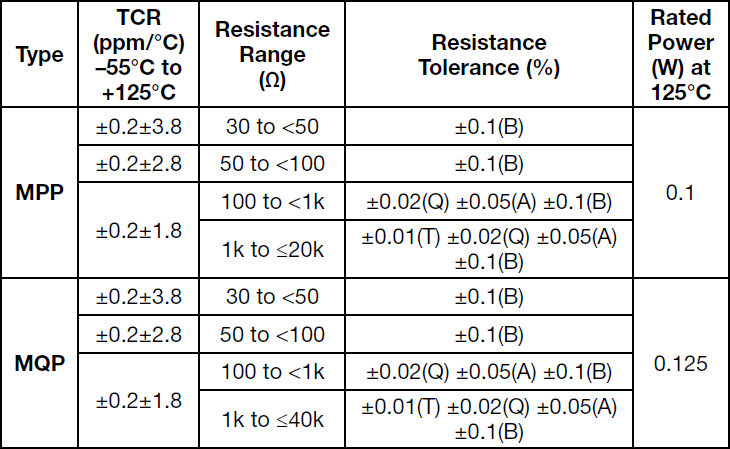 The MQ ultra-precision resistor series from Alpha Electronics offers a wide resistance range from 30Ω up to 60kΩ with tight tolerances down to +0.05% (100Ω to 60kΩ), all in a small surface-mount package. By utilising Alpha's Bulk Metal® foil resistor technology, they are able to produce resistors with low temperature coefficients and excellent long-term stability. The Alpha MQ series J-lead terminals provide flexibility compared to standard fixed surface-mount resistors as the resistive element internally is mechanically isolated from the leads via gold wire-bonding. Alpha's MQ surface-mount, ultra-precision resistor series exhibit excellent high frequency characteristics thanks to their Bulk Metal® foil resistor technology, making them suitable for the most demanding precision applications. The MQH ultra-precision resistor series from Alpha Electronics offers a wide resistance range from 30Ω up to 60kΩ with tight tolerances down to +0.05% (100Ω to 60kΩ), all in a small surface-mount package. By utilising Alpha's Bulk Metal® foil resistor technology, they are able to produce resistors with low temperature coefficients and excellent long-term stability. Expanding on the standard Alpha MQ series, the MQH series offers gold-plated J-lead terminals making them suitable for higher temperatures of up to +200°C. The gold-plated J-lead terminals provide flexibility compared to standard fixed surface-mount resistors as the resistive element internally is mechanically isolated from the leads via gold wire-bonding. Alpha's MQH surface-mount, ultra-precision resistor series exhibit excellent high frequency characteristics thanks to their Bulk Metal® foil resistor technology, making them suitable for the most demanding precision applications. The MQP Z-foil resistor series from Alpha Electronics offers ultra high-precision including a TCR of ±0.2 ppm/°C (typical) as well as a wide resistance range from 30Ω up to 40kΩ, all in a small surface-mount package. By utilising Alpha's Z-foil resistor technology, they are able to produce resistors with a temperature coefficient of almost zero and excellent long-term stability. Expanding on the standard Alpha MQ series, the MQP series offers double the power rating at +70°C and the same power rating up to +125°C. The J-lead terminals provide flexibility compared to standard fixed surface-mount resistors as the resistive element internally is mechanically isolated from the leads via gold wire-bonding. Alpha's MQP surface-mount, ultra high-precision resistor series exhibit excellent high frequency characteristics thanks to their new generation Z-foil technology, making them suitable for the most demanding precision applications. The HC0202 high ohmic bondable chip resistor series from Ohmcraft® offers a resistance range from 1kΩ up to 500MΩ all in very small 0202 chip size package. By utilising their patented Micropen® precision printing technology, they are able to provide an entirely new level of performance and stability in thick-film surface-mount resistors. HC0202 resistors offer very low noise, ultra-high stability with tolerances down to ±0.5%, TCR as low as ±25 ppm/°C and VCR down to 1 ppm/V. Ohmcraft's HC0202 high ohmic surface-mount resistors are available with wire-bondable Gold (Au) terminations. Standard case sizes for the HC series are 0202, 0303, 0403, 0404, 0502 and 0505, with custom case sizes available. 1Other custom case sizes are available. 2The continuous maximum voltage applied cannot exceed the maximum power rating. The HC0303 high ohmic bondable chip resistor series from Ohmcraft® offers a resistance range from 1kΩ up to 10GΩ all in very small 0303 chip size package. By utilising their patented Micropen® precision printing technology, they are able to provide an entirely new level of performance and stability in thick-film surface-mount resistors. HC0303 resistors offer very low noise, ultra-high stability with tolerances down to ±0.5%, TCR as low as ±25 ppm/°C and VCR down to 1 ppm/V. Ohmcraft's HC0303 high ohmic surface-mount resistors are available with wire-bondable Gold (Au) terminations. The HC0403 high ohmic bondable chip resistor series from Ohmcraft® offers a resistance range from 1kΩ up to 50GΩ all in very small 0403 chip size package. By utilising their patented Micropen® precision printing technology, they are able to provide an entirely new level of performance and stability in thick-film surface-mount resistors. HC0403 resistors offer very low noise, ultra-high stability with tolerances down to ±0.5%, TCR as low as ±25 ppm/°C and VCR down to 1 ppm/V. 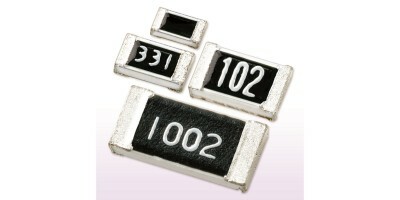 Ohmcraft's HC0403 high ohmic surface-mount resistors are available with wire-bondable Gold (Au) terminations. The HC0404 high ohmic bondable chip resistor series from Ohmcraft® offers a resistance range from 1kΩ up to 50GΩ all in very small 0404 chip size package. By utilising their patented Micropen® precision printing technology, they are able to provide an entirely new level of performance and stability in thick-film surface-mount resistors. HC0404 resistors offer very low noise, ultra-high stability with tolerances down to ±0.5%, TCR as low as ±25 ppm/°C and VCR down to 1 ppm/V. Ohmcraft's HC0404 high ohmic surface-mount resistors are available with wire-bondable Gold (Au) terminations. The HC0502 high ohmic bondable chip resistor series from Ohmcraft® offers a resistance range from 1kΩ up to 10GΩ all in very small 0502 chip size package. By utilising their patented Micropen® precision printing technology, they are able to provide an entirely new level of performance and stability in thick-film surface-mount resistors. HC0502 resistors offer very low noise, ultra-high stability with tolerances down to ±0.5%, TCR as low as ±25 ppm/°C and VCR down to 1 ppm/V. Ohmcraft's HC0502 high ohmic surface-mount resistors are available with wire-bondable Gold (Au) terminations. The HC0505 high ohmic bondable chip resistor series from Ohmcraft® offers a resistance range from 1kΩ up to 50GΩ all in very small 0505 chip size package. By utilising their patented Micropen® precision printing technology, they are able to provide an entirely new level of performance and stability in thick-film surface-mount resistors. HC0505 resistors offer very low noise, ultra-high stability with tolerances down to ±0.5%, TCR as low as ±25 ppm/°C and VCR down to 1 ppm/V. Ohmcraft's HC0505 high ohmic surface-mount resistors are available with wire-bondable Gold (Au) terminations. The SM0402 high ohmic chip resistor series from Ohmcraft® offers a resistance range from 10kΩ up to 1GΩ all in a 0402 chip size package. By utilising their patented Micropen® precision printing technology, they are able to provide a superior precision, thick-film surface-mount resistor. SM0402 resistors offer very low noise, ultra-high stability with tolerances down to ±1% (between 10kΩ and 500MΩ), TCR as low as ±50 ppm/°C (between 10kΩ and 100MΩ) and VCR down to 1 ppm/V. Please see the SM series datasheet under the Technical Library tab for other available chip sizes and standard products.